I’m noticing personas popping up more frequently in my work. Two years ago I wasn’t using personas in my work. A year ago I would have made a very deliberate choice to use a persona to explore an aspect of a problem or opportunity. Now there is a fluidity to when and how I use personas that has embedded itself in how I work and think. In part this is a consequence of having developed and delivered the ‘From Order Taker to Performance Partner’ workshop four times with Arun Pradhan earlier this year. Development of personas was a step in the performance-based process at the heart of this workshop. Perhaps this level of exposure and repetition has just ingrained the value of personas as part my process. They’re an efficient and effective way to undertake people-centred exploration of issues and opportunities. Last week I got ‘stuck’ writing a blog post about Industry 4.0 and tacit knowledge. When this happens it sometimes helps me to hand-write, exploring what I know about a topic and what questions I have. 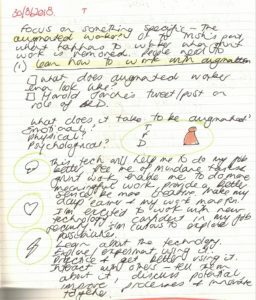 As you can see from my note-book page below I started to explore what people need to learn to become an augmented worker (people working closely with robots and Artificial Intelligence). I very quickly drew up a small human shape and symbols to prompt me to brainstorm what a person would need to think, feel and do to be effective as an augmented worker. While this is just a rough first draft, it illustrates how I used a persona to get a human-centred perspective on my question. In July I ran a workshop with a software training team whose leader wanted to define a more sustainable operating model. I wanted to introduce them to personas as a tool for designing learning and performance solutions. I also saw a personas as a useful way of exploring the needs and motivations of different groups important to design of a new operating model. It is easy to overlook the experience of the team itself as a stakeholder – so this is where we started. I facilitated development of a persona for a representative member of their team. 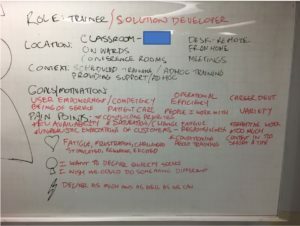 I used an expanded version of the persona for this where we identified their motivation, pain points and needs in doing their job and providing a service. Where and How Are You Using Personas? A number of recent guests on my Learning Uncut podcast have spoken about how they use personas in their work. Although the tool originated in design of products and services, it is being adopted by more Learning and Development professionals. Personas are rapidly becoming a mainstream tool in learning and performance solution design. I note that Connie Malamed wrote an article about using personas for Instructional Design way back in 2009.